Sunday was the season 9 opener for The Walking Dead, and the--what--season 48?--opener for Doctor Who, the British SF series originally designed for children that went into development the year I was born. It was also my only night off that week, so even though my wife doesn't like watching more than an hour and a half or so of TV a night, we managed to catch both of them close to the hour of their premiers. They'd make for a great crossover, since the Doctor often seems to spend most of his time running from things that want to eat him, anyway. Many think The Walking Dead has stumbled the last few seasons, and despite the fun presence of Jeffrey Dean Morgan as Negan, the show's best villain yet, they're not wrong. (Your opinion may vary--The Governor was pretty cool, in a bad way.) It's hard to keep a show fresh for going on ten years, even killing off several major characters every year. But this time around The Walking Dead does seem to have invigorated itself with season 9, which flashes forward several months from the climactic battle with Negan's Saviors at the end of S8. Negan is imprisoned, the Saviors part of a wider attempt at a community, Maggie's years-long pregnancy is past, and one of the show's most annoying bad guys is no longer hanging around by the end of the episode. 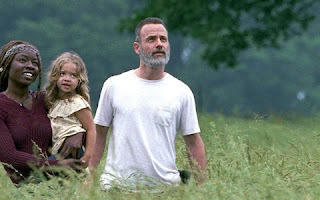 There's a new show runner, and we go in with the announcement that Andrew Lincoln's Rick is exiting the show, apparently at the mid-seAson break. The perfect time for A New Beginning, which happens to be the title of the episode. It mostly concerns a mission into Washington, D.C., and its aftermath, and we get both hope for the future and hints of conflicts to come. Lots of people watch The Walking Dead for the zombies, and there are plenty stumbling around. I watch the show for the characters, and in that it remains strong. Whether it can continue to be strong without the strong center of Rick I don't know, but ... so far, so good. Meanwhile, back in England, a mysterious woman who can't remember her own name falls out of the sky--literally. For the uninitiated, The Doctor (His/her name is not "Doctor Who") is a time and space traveling alien who can cheat death by regenerating into a new body. The thirteenth Doctor is also the first female one, played by Jodie Whittaker as caring, a little frenetic, and slightly daft, about the average for the more recent Doctors. Instead of getting the time she needs to adjust to her new self, the Doctor is thrown into a mystery involving a mysterious alien device--a lot of alien tech ends up in England--followed by a nasty alien warrior. The Doctor follows his--um, her--usual pattern by collecting together some new companions and throwing them in the deep end. There's been a lot of discussion about this version of the Doctor, some of it pretty nasty. 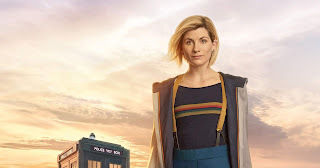 I'm not a fan of gender swapping established characters, but in this case we already know the Doctor can swap bodies, and being an alien there's no reason why he can't regenerate into a she. My normal new Doctor fears evaporated by the end of the episode: Whittaker does a good job, and as she adjusts to the role might become great at it. Unfortunately, my concerns about the rest of the show remain. The writers seem determined to avoid any connection to the former Doctor Who universe, having ditched last season's companions and announced there would be no appearance this season by the more popular villains. We didn't even get the iconic opening credits, and the theme music only faded in for a moment when the Doctor first appears. The Doctor's ship, the TARDIS, didn't even show up in the episode. That seems like a terrible idea, to introduce a brand new doctor and not keep anything to anchor long time fans. What, Bill and/or Nardole couldn't have stuck around for another season? To make matters worse, the new companions seem a bit uninteresting in comparison, and the episode as a whole had little of the comedic flash that often gave relief to darker storylines. "It's darker" isn't necessarily a compliment. In short, the new Doctor is fine; but the new season needs some work. I agree about Doctor Who. Usually having the previous companion (or two) helps to bridge the gap between the old and new Doctor. I also think it makes for some good comparisons between the two as the companion usually has at last one comment about their previous incarnation (usually detrimental or tongue in cheek). I had also forgotten she fell out of the Tardis so the beginning took a while to make sense for me!! Yes, I forgot about her falling out too, but I just went with it. Memorable appearances are part of the fun, after all! In any case, I still have high hopes for this season--one episode isn't enough to judge it on.